Many Hongkongers are in love with Korean food, the moment I reveal(?) my identity as Korean, I start getting bombarded with a flurry of questions like, where to go for Korean BBQ. While there are quite a few good Korean BBQ places in HK, Korean food is not all about BBQ, just as Sushi doesn’t represent diverse Japanese cuisine. Below are some of great finds where we Koreans love to visit for no-frills, good Korean food. These are all great, but they specialize in different types of food, so simply grab one of your choice, depending on your mood today. Arirang is the place to go whenever I have a craving for Korean food at a comfortable, down-to-earth setting. While more and more unique, fun places offering fusion Korean food are popping up throughout the city, I still think food at Arirang is one of the most authentic kinds. Its menu option is very extensive, running the gamut from simple “Sundubu Jjigae”(spicy Beancurd soup), “Bibimbab”(mixed vegetable rice) to all types of BBQ and Korean hotpot, you just name it. Hwaduk is sort of way fancier version of usual Korean fried chicken place that you might find in Korea. From the moment I dined at Hwaduk, which opened less than two years ago, I have been a big fan of Hwaduk with the quality of its “Oven Roasted Chicken” (not fried!) and all other dishes, even “Gorgonzola pizza with honey” tasted better than any other pizzerias. “Burrata & Fig in Modena balsamic vinegar” or “Cacio pepe e noci rice cakes” doesn’t sound like your typical Korean dish, however this Korean chef trained in Italy has been doing so good for creating amazing Korean-Italian fusion food. As Korean myself, I don’t usually eat at Korean-fusion restaurants but Moyo‘s creative menu incorporating familiar flavor with foreign ingredient is worthwhile to try. Verdict: I have been to Arirang more than 15 times and Hwaduk 10 times on various occasions but it is in Korea where you can taste the best Korean food, stating the obvious. It is only a 3.5 hour-flight from HK and you can enjoy amazing Korean food feast at around 1/3 price (in Seoul) and even less (in other cities) than you would pay for in HK. The diversity and quality of Korean food is unrivalled. So why not planning your trip to Korea for your next food adventure? Forget about something British influences about high-tea tradition, graceful afternoon gourmet pastime or whatever it’s called, afternoon tea in HK can be another great excuse of satisfying our sweet tooth in a less guilty(?) way. Who cares about putting some extra pounds when a wide variety of beautifully arranged savory and sweet choices are right in front of you? My afternoon tea experience at Gradini, was one of the best in HK for both absolute quality and value for price, so I decided to dedicate my posting today solely to Gradini, Pottinger. It is actually a hidden-gem that most tourists or even Hongkongers are not aware of its true value, so I am happy to share this amazing place with you. Having already experienced its great Italian meal at Gradini, I’ve had a certain degree of expectation about afternoon tea here. But with its price almost 30% cheaper than most of other famous high-tea places nearby in central, I somehow didn’t expect too much at the same time. But when this tea-set tray came to our table, I could instantly sense that this can probably be my favorite afternoon tea experience, and it truly was. Gradini, Pottinger Hotel (74 Queen’s Road Central, Central) Amazing afternoon tea set amounts only to HKD 188(USD24), one savory tray and the other sweet tray with a choice of coffee or tea. This extra hot cup of cappuccino with liberal amount of cinnamon power paired so well with above equally great food. Savory choice: San Daniella ham with a fig, buffalo mozzarella with tomato sandwich, lobster sandwich, curry and meat puff, two thumbs up! Sweet choice: Tiramisu, panna cotta, macaroon, scone, egg yolk cake, heavenly! You can simply order dessert a la carte, if you don’t want to be overwhelmed with huge afternoon tea set. Above features their signature “Moscato Jelly with fresh berry compote honey cone and coconut gelato” and “Tiramisu classico del pasticcere”. Verdict: While it is conveniently located in hustle and bustle of central district lined with world-renowned brand shops, its tucked-away location slightly above busy Queen’s Road Central makes Gradini a quiet sanctuary for gourmands. While afternoon tea set is sometimes filled with too much unnecessary kinds of food, one at Gradini presents an adequate amount of portion, making one tea set enough for two people. With its premium quality ingredient, snug ambience and price tag being so unlike central, value of afternoon tea at Gradini easily tops most of other popular venues in HK. The fact that Hong Kong is home to 2nd largest French community living abroad, following London, makes it one of the most ideal places to taste authentic croissants, baguettes and macaroons. Even McDonald’s have offered their version of macaroons, pressured by this recent “French” fad in Hong Kong, although it is hard to vouch for its taste. Below are my go-to French restaurants in HK for various occasions and you will see which one suits you best while following this post. 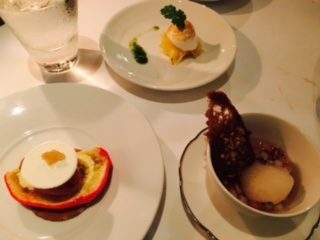 Initial disappointment that Arcane doesn’t have dinner course menu as most other French restaurants do (but they can offer customized tasting menu if you request) immediately turned into awe and respect upon tasting their famous appetizers, truffle gnocchi and Japanese fruit tomato. Indefinite satisfaction coming out of refined taste emphasizing the quality of ingredient, artistic presentation and sophisticated venue gave us an impression that I am dining, somewhere in Montreal. Have you ever eaten in the dark? Yes, I mean, completely dark that you won’t even see what you are eating and the person you are eating with. Although cutlery is offered, you will soon find yourself eating with two hands(as you can’t see anything at all) and the 5-course dinner focusing on its original flavour minus visual presentation (sometimes unnecessary) tastes extremely good. It was a fun-filled experience to dine in Upper Modern Bistro with its uniquely shaped ceiling and vivid decoration. Philippe Oricco (also a chef of Michelin-starred restaurant On Dining)’s name gives this venue an indisputable authenticity and half of the patrons seem like French-speaking people. Verdict: Arcane fits the true definition of fine dining, so good for special celebrations. Le Bistro Winebeast has the greatest value for both price and taste. Try Lounge at Alchemy if you truly appreciate good food in an artistically decorated surroundings and go for dining in the dark if you are a real adventurer. For those who wish to focus solely on food, Serge et le phoque can be your best bet. Where would you go to have an early morning chat with your friends over a good cup of coffee or something to munch in Hong Kong? Check out the places below that are worth visiting for incredibly good breakfast on HK island side. Sheung Wan is gaining crowds of royal followers in culinary scenes for the recent few years and this place is leading the cafe trend with its barista winning two-time HK barista championship. From the facade on Cleverly street entrance, you might easily mistake Cupping room for a cafe somewhere in Brooklyn, New York, with its unique ambience and hipster patrons. If you are visiting HK, chances are you will be encountered with (at least) one of Robuchon’s cafes located in fancy shopping malls, like Landmark central, IFC Four seasons entrance and Elements in Kowloon station, etc. Reputation being Michelin three-starred restaurant with its international presence always attracts many visitors as well as residents in search of good croissants and baguettes. Their baguettes and croissants are one of the best in HK and recent find of “Banana chocolate croissant” covered with almond slices and cinnamon powders literally put me in a sinful spiral. Flaky exterior texture of the croissants surprisingly matching the moist banana flavors inside, my attempt of trying only half of those two my favorite croissants (leaving half for later consumption) never succeeds. However, it gives me another compelling reason to work out at the gym, so it is not too bad to devour all those calories. This bakery in Mandarin Oriental Hotel is the one that I’ve most frequented while living in HK before finding two above-mentioned places. Eating these beautifully presented pastries with a cup of Americano has been my weekend morning ritual, usually followed by a grocery shopping at Oliver’s in the adjacent Prince’s Building. As its name suggests, this place treats coffee quite seriously and uses THE espresso machine ” La Marzocco” (If you find coffee shop using this coffee machine, the quality of their coffee is 90% guaranteed.) While Coffee Academics has a few presence in HK, this quiet venue on Wan Chai Road is the best of all, giving you serene moment of reading books and working on-line. Verdict: If you are a visitor to HK, Mandarin Oriental cake shop and Joel Robuchon bakery are perfect places for great pastries and coffee in a snug setting of luxurious hotel and mall. You won’t miss Oolaa if you follow the travel guide route of happening SoHo and trendy Taiping Shan district and this place is always popular with both visitors and residents alike. If you are serious about coffee and food, head directly to Cupping Room and Coffee Academics(for the coffee) and the unique ambience exuding hipster vibe will truly make you feel like a cafe trendsetter. I didn’t grow up eating Dim Sum, although I consider myself pretty much exposed to different types of Dim Sum while living in various countries (My first encounter of Dim Sum was at Chinatown in London 17 years ago and I was literally awed by all those moving carts). My picks in this post don’t necessarily reflect the most famous or authentic Dim Sum experience in Hong Kong. Rather, they represent quite decent Dim Sum places offering quality ingredient in a child-friendly setting (Yes, my kids were always with us at Sunday Dim Sum feast). 3. Fook Lam Moon (Shop 3, G/F, Newman House, 35-45 Johnston Road, Wan Chai): It is in Fook Lam Moon where people can test how much money they can spend solely on food (Some of menu’s eye-popping price will keep you wondering whether you’re looking at a price for food or plane tickets to Europe). However, unless you go for something like “Exclusive dry aged abalone from Japan” or “Supreme Fish Maw/sea cucumber”, most of the safe Dim Sum choices are within fairly(?) reasonable price range and extremely superior quality of ingredients will make you nod why movers and shakers in HK come to dine here. Indeed, we had the luck to spot a table with celebrities near us. Although my inner instinct urged me to take pictures, I decided to leave them alone as this is THE place where celebrities want to enjoy their food quietly. 4. Dim Sum Library (shop 124, 1/F, Pacific Place, 88 Queensway, Admiralty): “Black truffle har gau-shrimp dumplings” or ” Prawn & mozzarella rice paper wrap” or “Hokkaido king crab & sea urchin spring rolls” doesn’t sound like typical Dim Sum dish. But this chic-hipster-fusion Dim Sum venue at posh Pacific Place draws huge crowd, making it almost impossible for us to eat here without reservation days in advance. Although above-mentioned high quality Dim Sum places are always the safe bet, my fondest memories go to when I went with local friends and I was truly amazed by hustle and bustle of the scene. You can’t go wrong with following your local friends in terms of Dim Sum and I will post more quintessential Dim Sum places in HK later. Verdict: The Square is always right with its vast menu options/reasonable price and the perfect place to get together as a group. Look no further than Summer Palace if you need to impress and treat visitors or you have the luck to eat when someone else picks up the tab. Head directly to Fook Lam Moon if you need some zest in your culinary life and have a deep pocket. As Dim Sum Library is all-day Dim Sum spot, you can literally go anytime when you have a craving for Dim Sum. Who doesn’t like good Italian food? Yes, GOOD Italian food. Below are my go-to places in HK for different occasions. We tried lunch most of the time, as lunch menu is sometimes more extensive with its antipasto buffet offering and way less expensive than dinner (about three times), thus truly bang for the buck! The very definition of Italian food seems to vary among difference countries. While Western countries consider Italian food as family-style comfort food, we Easterners immediately associate Italian food with luxury and sophistication, thus Italian restauranteurs here in HK found themselves having hard time meeting various customers’ expectation. But this is Hong Kong, so any style will find its own place. I didn’t include Grappa, another my favorite for casual dining, simply because I don’t have any available photos. There are more hidden-gem Italian places in HK, which I will post later. Verdict : Gia Trattoria and Giando are my picks of Italian with their ingredient /recipe /ambience being true to the basics and Gradini is for little special occasions. Sabatini is good for one-time dining experience and I will eat at 8 1/2 Otto e Mezzo Bombana everyday if I am rolling in money.